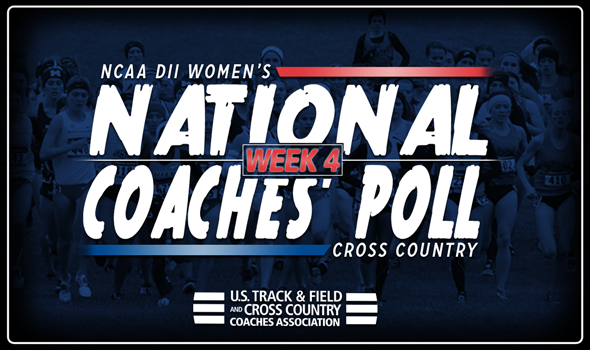 NEW ORLEANS – Two new teams entered the top-10 of the NCAA Division II Women’s Cross Country National Coaches’ Poll, announced by the U.S. Track & Field and Cross Country Coaches Association (USTFCCCA) on Wednesday, while another squad already in the top-five continued to rise in the polls. In an otherwise dormant top-10, Walsh and Colorado Mines made astronomical climbs to both tie for 10th on the week after solid weeks in action. Additionally, Simon Fraser jumped one spot to a program-best fourth after starting the season at 14th, only to climb to seventh a week later and eventually fifth during the second week of the season. Walsh impressed at the All Ohio Championships, where the team finished third overall – and first amongst NCAA Division II teams – thanks to a first-place finish from Sarah Berger, who led all 343 runners with a time of 20:52.0. Walsh came in at 19th in the rankings a week ago, and the tie for 10th is a program-best ranking. Colorado Mines – who was 21st in the polls a week ago – was equally as solid, winning the non-Division I portion of the Chile Pepper XC Festival. Megan Wenham (17:24.0 – fifth) and Molly Reicher (17:26.2 – sixth) both finished within the top-10 of a race that featured 296 finishers. The top-10 ranking for the Orediggers was its first since ranking ninth in the final poll of the 2005 season. Despite an idle weekend, Simon Fraser rose to fourth after Hillsdale slipped to fifth following a tough weekend at the Cross Country Classic in Louisville. Grand Valley State was strong at the Cross Country Classic, winning the NCAA Division II portion of the gold race to remain in first place in the polls. The Lakers, however, did lose a first-place vote to Adams State, who held onto its second-place spot. The Grizzlies finished 10th at the Paul Short Run Gold race, ahead of a slew of NCAA Division I programs. Western State was inactive over the weekend, staying in third place in the polls. Cal Baptist (sixth), Pittsburg State (seventh), Southern Indiana (eighth) and Cal State San Marcos (ninth) rounded out the top-10. Outside of the top-10, only two teams saw their stock increase in the remainder of the top-25. Lee (Tenn.) crept up one spot to 14th after a big win at the Royals XC Challenge after falling to 15th a week ago. Malone also re-entered the rankings after falling out of the polls after the first week of the season. The Pioneers came in at 22nd after finishing second at the All Ohio Championships. Eight of the final 15 teams in the top-25 this week fell from where they were a week ago.